Today is National Strawberry Shortcake Day! I just realized my love for indulging desserts has changed into trying to make them healthy or into a meal. I also have found that I make a lot of breakfasts inspired by desserts. I thought about it and finally figured out why this works so well for me. I love desserts but don’t love how they make me feel after and how unhealthy they are. Trying to turn them into a healthy breakfast even if they aren’t “low-calorie” works great because I get my sweet fix, I am not deprived, and I can use it to fuel me all day and work those calories off rather than go to bed with a big over the top dessert sitting in my tummy. So back to National Strawberry Shortcake Day! 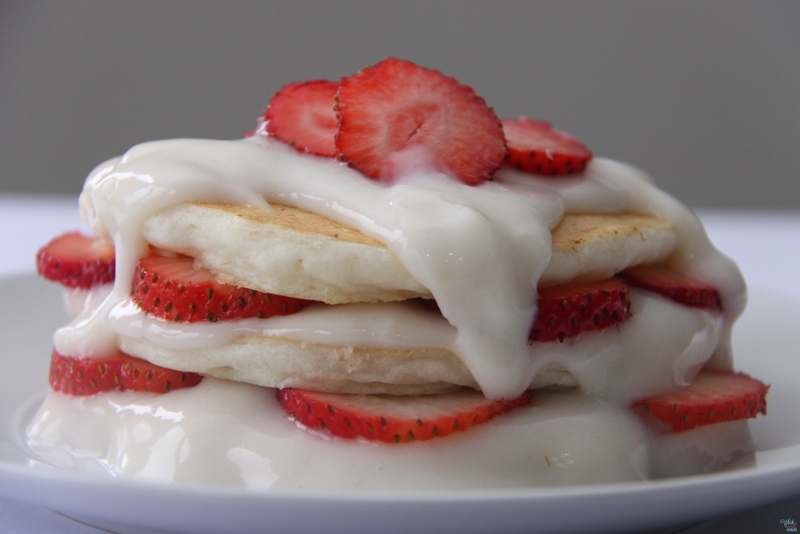 These pancakes taste like fluffy angel food cake! 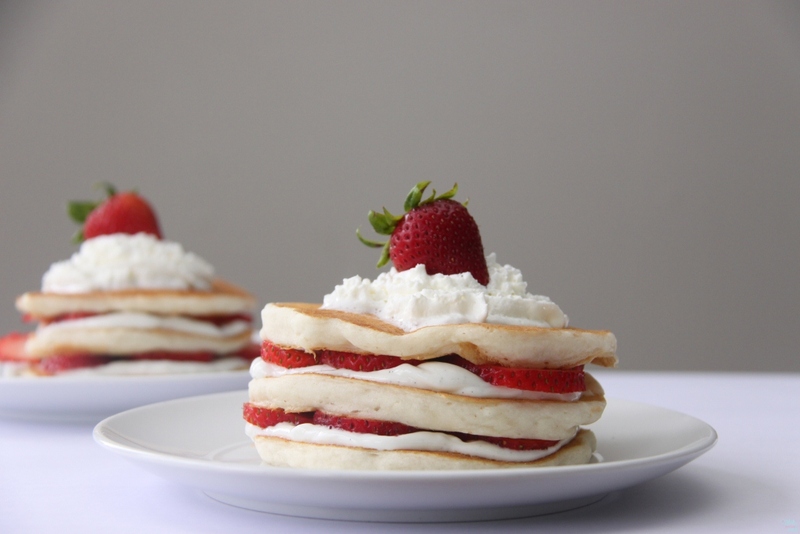 Pair them with fresh strawberries, yogurt and or whipped cream and you have got yourself delicious Strawberry Shortcake Pancakes! I was told a trick to fluffy pancakes was to make them as you would scones using a pastry cutter, makes sense, I use to make scones every Sunday for “Scone Sunday” in our house my girls and I started and cutting in the butter was a key step to creating air pockets and the texture of the scones. I usually will just put everything in my Vitamix and why they turn out great I think this method provides a slightly more consistent fluffier results. It should also be noted that the best version I have made of these pancakes, making them countless times, is with Gluten Free Cup 4 Cup Flour. However they are great with all-purpose white flour and while they will work with wheat flour (whole wheat or whole wheat white) they aren’t as fluffy and don’t have quit the same taste. For these pancakes I would stick to white flour or Cup 4 Cup Flour if possible. *The pancakes will not get fluffy and will not puff up if using whole wheat flour. If you want to use whole wheat flour do not use for more than half of the flour called for and mix with another flour. The batter does thicken as it sits but you may need to use an additional 1/4 cup of flour depending on flour used. I get the best results with gluten free all purpose flour. In a bowl mix together flour, sugar, baking powder, and salt. With a pastry cutter or two knives cut in coconut oil until you have a course crumbly mixture, there should be no large chunks of coconut oil. Add vanilla and almond extracts to your milk and slowly add milk to the flour mixture and whisk until smooth, there may be some small lumps. The batter will thicken as it sits. Heat a non stick griddle to medium- high and let heat up. You will want to have a hot griddle for this and do not spray it with non stick spray. Spoon mixture onto your griddle and cook until the edges are starting to look dry and set and bubbles are starting to hold in the center of the pancakes, flip and continue cooking until golden brown. Using a metal spatula works best and pancakes should release when they are ready. 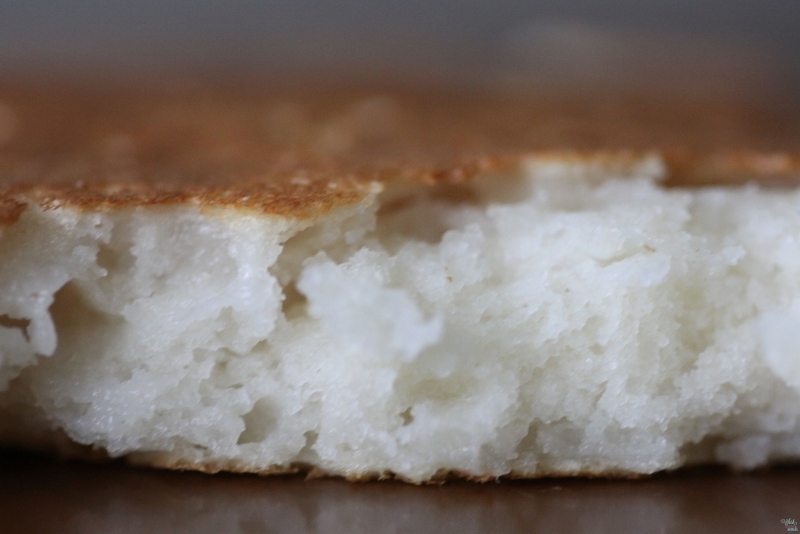 The pancakes should have the texture of angel food cake on the outside and be light and fluffy on the inside. 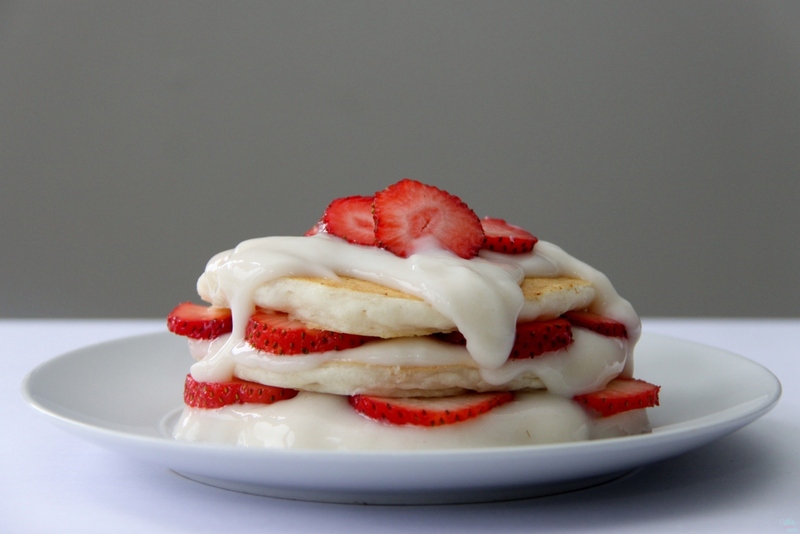 Assemble pancakes layering with strawberries and yogurt and or whipped cream. Enjoy! Yes you can have your cake and eat it for breakfast too!